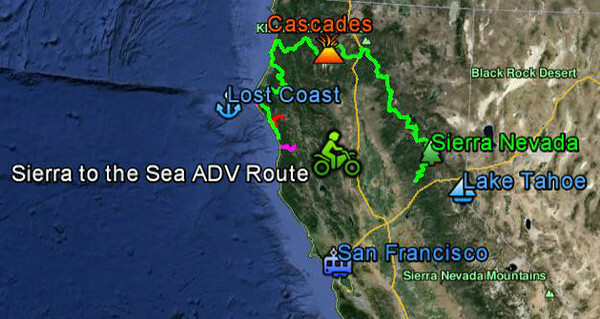 Sierra to the Sea/Sea to Sierra Adventure Route (S2S) is our 825-mile, eight-day, GPS-guided backcountry motor route from the Sierra Nevada to the largest coastal wildland in the Lower 48, the fabled "Lost Coast." S2S is focused on Northern California's most scenic, historic and remote unpaved backroads. The objective: To guide select wildland travelers through some of California's wildest vehicle-accessible backcountry with curated data that is accurate, useful and current. Sierra to the Sea/Sea to Sierra ... or just S2S. Our detailed, plug-and-play GPS data file will guide you accurately along every mile of the route. Unlike free routes, the routes that Backcountry Byways LLC develops are researched, documented and monitored by wildland-travel specialists with decades of on-the-ground experience in both adventure-motorcycle and SUV travel. Instead of simply GPS tracks and a handful of location markers (waypoints) that is typical of free routing, S2S comes with hundreds of waypoints for dozens of verified campsites and campgrounds, lodgings, fuel stops, difficult sections and more. Each is documented using Global Positioning System (GPS) coordinates and on-site observation. Importantly, our routes are not just a product, but a service that often can be tailored to the interests and itineraries of the most selective adventure travelers. Going far beyond the typical crowdsourced routing, we are committed to prompt, professional and even personalized products and services. Our clients get exclusive "anytime" support directly from the person most knowledgeable about the route, someone who can provide counsel that is prompt, convenient, and authoritative. Our clients don't have to subject themselves to mining social-media forums for credible input from anonymous strangers and amateurs. We get to know our clients. Many become friends, and return year after year. Knowing them as we do, we often can tailor a service to their expanding range of interests and experience. And we're available when they need us, from start to finish, even as they travel. A gold rush-era road, included in S2S. S2S travelers are immersed in the canyons and forests of Sierra Gold Country, the volcanic landscapes of Cascadia, the pastoral hills of the Coast Ranges and the windy bluffs above the Pacific Ocean. Overnight options include dispersed campsites in national forests, developed campgrounds, oceanside state parks, and motels and B&Bs in historic towns that trace their founding to the forty-niners and offshore lumber schooners. You'll cross streams once worked by forty-niners. Making the journey even more convenient, if you don't have a dedicated motor-vehicle GPS unit, you can load and follow our ".gpx" data file onto a smartphone or tablet. The Golden State lives up to its nickname. To get your S2S journey underway, send a note to Backcountry Byways LLC using the contact template on our front page. We respond promptly. After a telephone consultation to go over details, questions and concerns, Backcountry Byways LLC may license your exclusive use of our proprietary S2S track file. Another benefit: Substantial discounts are available from makers of premium motorcycling apparel and mapping products. Backcountry Byways LLC is based in the Rocky Mountains of Idaho, amid the largest expanses of publicly owned wildlands in America's Lower 48 states. We've been documenting the wildland roads of the American West since 1993 for guidebooks, magazines, newspapers, online publications, and individual and corporate clients. Our overland travels began much earlier, however, with monthslong journeys throughout North America as well as Latin America, eastern and western Europe, and North Africa. Don't wait! Start planning your wildland adventure today! We've done the work ... so you can live the dream.